As you may or may not know, the Windy Valley which appeared in the final version of Sonic Adventure wasn’t the same one that was shown through pre-release material. A year ago (today, in fact! ), Sonic Retro unearthed data from a Sonic Adventure prototype which contained a partial amount of this stage, as well as data from old versions of Ice Cap and At Dawn. Cut to today, and we have the above video thanks to Retro member evilhamwizard – a mostly complete version of what was once Windy Valley. Obviously this is still a work in progress with clearly unfinished camera and textures, but seeing a playable version is certainly a treat wouldn’t you say? That’s not all though. There’s a second video available showing off the first “act” of Windy Valley also. This one’s a little more complete with more enemies and rings abound, and a little bit of camera work. Of course it’s not perfect, but like it’s been said, it’s all a work in progress. Three cheers to evilhamwizard, and everyone else over at Retro who made this possible! If you wanna give these levels a shot, you’re free to do so if you own the SADX Mod Loader and the US version of Sonic Adventure DX for your PC. You can download the mod here, but be warned you’ll be fighting the camera. If you want more info, be sure to check out the original article over on Sonic Retro. Also, make sure you let us know what you think of this prototype Windy Valley in the comments below – good or bad? He’s the fastest thing alive! 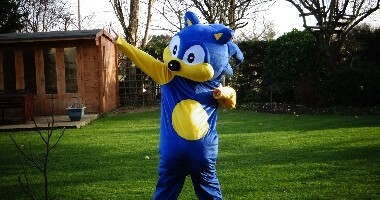 Sonic the Hedgehog will be partaking in the upcoming London Marathon to raise money to fight leukaemia. Well, er… that’s almost the truth. 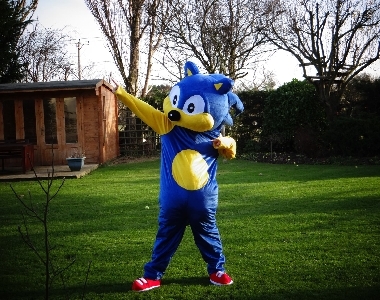 Inside that costume is twenty-two year old Lewis Griffiths from York, wearing his five kilogram Sonic the Hedgehog costume, in fact. He’ll be wearing it for the duration of the 26.2 mile marathon course coming up on the 13th April. Now that takes some dedication if I’ve seen it. Speaking to the Leukaemia CARE Charity, Lewis explains he’s running the marathon in the name of his cousin who was diagnosed with the disease when he was nineteen. Thankfully, he has since then been cured, though it’s not the end of the line for him as he will need multiple hip replacements and chemotherapy treatment following this. He’s also taking on the challenge for himself to help his own personal rehabilitation of his right leg which has had several operations on. “I am so pleased to be running for Leukaemia CARE and cannot wait for race day. From my cousin’s experience, I know that blood cancers can be beaten but the after effects of treatment can impact on people’s lives for a long time after recovery. Well if this wasn’t a good reason to give a little money to a charity, I don’t know what is. If you want to donate to Lewis’ cause, you can do so over on his Virgin Money Giving page. Good luck from all of us here at The Sonic Stadium, Lewis! Sonic Amateur Games Expo 2014 is a go! It’s that time of year again! 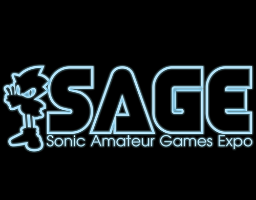 SAGE 2014 Act 1 has begun, the central hub for fangame developers to show off their work to the Sonic community. From February 23rd to March 1st, you can head on over to the SAGE website and try out a ton of fangames. This year has a plethora of titles to try including the Sonic CD-esque Sonic Time Twisted, the 3D Sonic Lost Adventure, and a game by a member of our community, Shirou Emiya, Digimon Heroic Battle Spirit – yep, it’s not just limited to Sonic titles! You can head over to the SAGE website now to try these and tons more – plus, members of the SAGE team are doing a livestream showcasing the various entries to the expo this year. What’re you waiting for? Go go go! 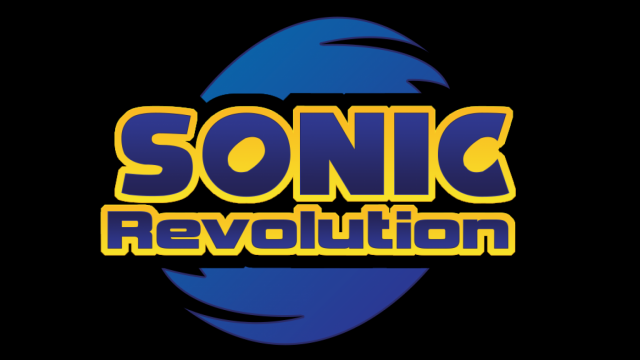 Following the first California-based Sonic the Hedgehog fan convention last year, Sonic Revolution returns in 2014 for a second time, promising to be an event even bigger and better than before. If you’re a resident of California, or can travel to Orange County mid-June, you can look forward to a day of Sonic-themed events, including a showing of an exclusive clip of Sonic Prologue film along with a Q&A with the director, an appearance and performance from the Sonic the Hedgehog cover band Serenity Seven, as well as opportunities for gaming and fan art showcasing. Tickets will be up for grabs on the 1st of March, 2014, and will be available through EventBrite for free. There will also be discount codes available for those wanting to stay the night at the hotel venue. The event is also holding a fundraiser in order to generate the capital for hosting the event – head on down to the fundraising page and make a donation; donations of $30 or more will receive a Sonic Revolution shirt and pin. Further details will become available over the coming weeks through the Sonic Revolution website. Sonic Boom or Sonic Bust? I remember a time not too long ago where one could wake up to find out that their favourite blue hedgehog had taken up the hover board, had decided that swords were cool, or had a accumulated another new friend to add to the already brimming roster of colourful critters. At the time, Sonic had suffered a spate of mediocre to down-right poor titles, the most notorious being Sonic ’06. The prevailing morale of the online community was pretty low and on the morning of the announcement of Sonic Unleashed, images of the Werehog did nothing to inspire or reassure fans that a title of note was in the making. Forums lit up with debate, sites quizzed their audiences with “will it be good, won’t it be good?” polls and comment boxes became an arena for conflicts of opinion. Many fans at the time, including myself, were certain that the train of thought implemented in the making of Sonic titles had become intrinsically flawed, with focus on graphics and sheen, rather than gameplay. Many desired to see a return to the roots of what made the classic Sonic titles so good, which ironically backfired somewhat with the development of Sonic the Hedgehog 4: Episode I. The last thing we were interested in was another gimmick, and this is what it looked like SEGA were about to present us with. On this occasion however, I couldn’t have been happier to be proven wrong. I love Sonic Unleashed, from the diverse soundtrack, to the lush worlds, to the level design to the Pixar feel of the characters. While not a perfect game in many respects, it was fun, and had elements to please both old and new fans. Not only that, Night of the Werehog was a fantastic little bonus; ten minutes of distilled genius and beautiful animation. Fast forward six years and we seem to be back at this juncture once more. Sonic the Hedgehog fans have had a lot of new information to assimilate over the last 48 hours with regards to the announcement of Sonic Boom, which will hit screens later in the year in both TV show and videogame incarnations. Scanning through my facebook feed, the general vibe from a lot of the younger members of the community is one of excitement at the prospect of another TV show, after all it has been a decade since Sonic X premiered on western screens (has it really been that long?). However, these announcements have been completely eclipsed by the news and images of the new character designs, which have in the cases for some characters, been fairly drastic. But haven’t we been here before? If so, what is all the fuss about? Well, a few months back, we were all given a glimpse of some familiar shadows set against a wall. 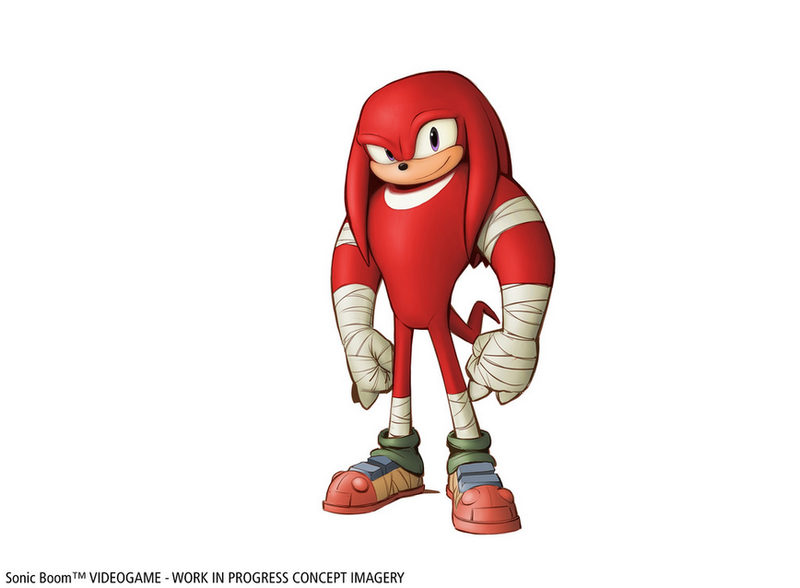 It was obvious that the main characters of the franchise were looking to get a makeover, and internet speculation about whether or not Knuckles had been hitting the gym exploded onto every Sonic-themed forum. It seems almost seems surprising therefore, that the community has reacted in the way they have, given there was fair warning substantial changes to the character models were on the horizon. Indeed, Knuckles looks like he has now swallowed the Master emerald in a last-ditch attempt to prevent it from getting nicked. Other characters seem to have been less drastically altered, in most cases proportions have been subtly tweaked, and many would be forgiven in suggesting the team have had a recent run-in with the Andrex puppy. Admittedly, I’ve had a good giggle at some fan parodies and interpretations of these changes. Fortunately, fan reaction has been tempered by a follow up announcement that Sonic Boom would remain an isolated “sub franchise” and that these changes would not be canon. So again, we come back to the question: what’s the big deal? Why has something like a change in the colour of Sonic’s arms hit such a nerve amongst fans? Well, the likely answer to that is probably many fold. Firstly and most obviously, many fans probably fear that SEGA are back on down the gimmick route to promote new games. Sonic Lost World didn’t quite achieve the accolade many thought it might, and it’s understandable that there is apprehension over whether this is the dawn of the second era of the so-called “Sonic cycle”. Secondly, and more importantly I think, is the change in the base properties of the franchise. There aren’t many other fandoms that command such a loyal legion as Sonic does, and many are invested in the characters, the stories and the universe on the whole. So when something fundamental is modified, no matter how trivial it may seem to someone on the outside looking in, fans are going to react negatively; after all, why change something that isn’t broken? Indeed, most fans are questioning the necessity of equipping a hedgehog with a scarf and a copious quantity of sports bandages. Perhaps in some cases it is purely personal opinion. More curiously, many have noticed how pedantic SEGA have been in the past with regards to attention to character models, what they are allowed to be doing, and how they are represented in any media. 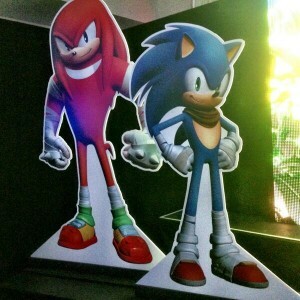 Many perceive this as an almost complete U-turn on this previous ethos, and has opened up speculation to whether or not this is the result of a shift in those who call the shots when it comes to the franchise globally (although a recent statement from Iizuka picked up on TSSZ News announced that Boom will only be available to western markets). The counter opinion of course, is that sometimes, change is good. You probably wouldn’t be seen dead in the clothes you were wearing a decade ago, and indeed, it could be seen as logical in this sense that over time, some things will inevitably update in order to remain fresh, keep with trends, and of course, interest a new generation. 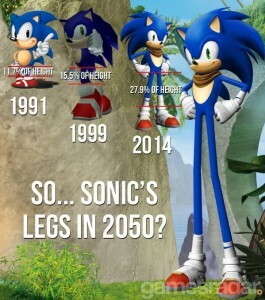 Back in 1998, Sonic underwent his transformation from a short fat spike-ball to a more athletic, green-eyed iteration of himself; that metamorphosis seemed on the whole a successful transition. 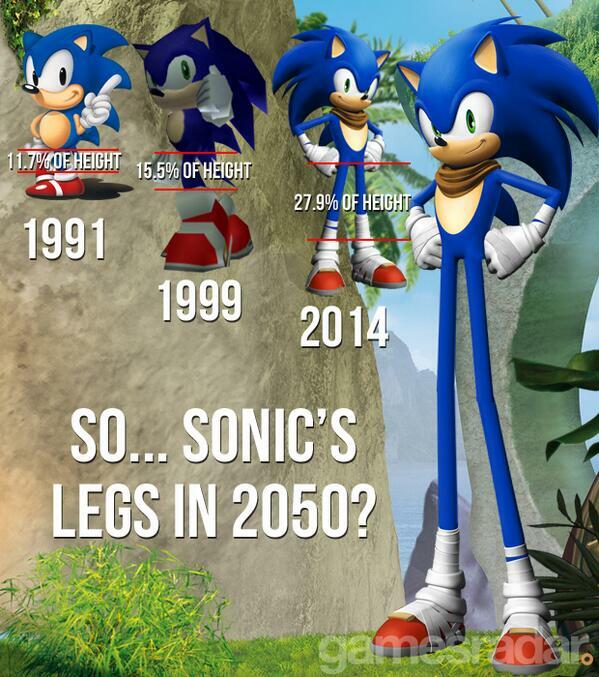 Examining the timescales between those character models, it does seem like Sonic is well overdue a cosmetic overhaul. Those of you who, like me, pine for another title with the same DNA as Unleashed, will no doubt be as giddy as I to see stunning pieces of concept art of environments, and some extremely amusing facial expressions from the cast, which lead to believe we will be getting a game with rich worlds to explore akin to Unleashed. Those worried about the game have had some reassuring news in that the development is in the hands of those behind the Uncharted and Jak and Daxter franchises (now developing under the name of Big Red Button), and if the quality of these titles are a reflection of what the next Sonic game will be like, we have nothing to worry about. The attitudes of SEGA have also markedly changed in the past half-decade, with the growth of an extremely competent and capable community team who have been receptive of fan feedback. On top of this, the connection to fans has been reinforced through events such as Sonic Boom in the states and Summer of Sonic in the UK, which have both received an incredible reception from attending patrons. I think as a community we have matured in many aspects; after all, many have now been fans for over twenty years; some are now employed in the video game business and are more able to understand the intricate nuisances that go into making a video game. That said, I think we shouldn’t fall into the trap of becoming grumpy old women and men, and forming opinions on changes purely because they “aren’t as good as they were back in the good old days”. There isn’t a right or wrong answer to whether or not you think the new direction Sonic is taking will be good or bad, as after all the main component at the end of the day is personal preference. I hope as an older and somewhat wiser community, we can hold final judgement of the “Sonic Renaissance” until we’ve seen the final product. After all, we’ve only just read the first page of this new chapter of Sonic the Hedgehog. 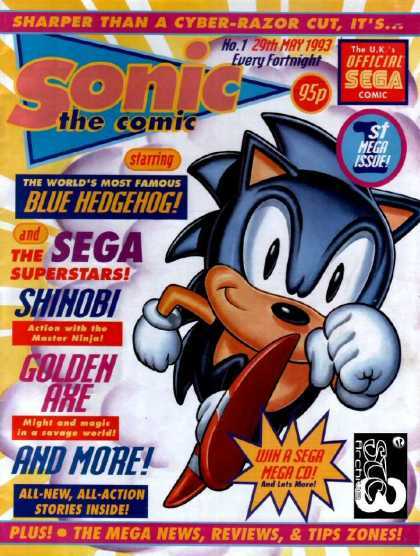 Twenty years ago, many veteran fans amongst the community will probably remember racing to their local newsagents in order to grab the first issue of Sonic the Comic for the paltry price of 95 pence, and thumbing excitedly through the first pages of Sonic and SEGA-themed strips. In the many years that followed, fans saw the publication of 223 issues, 9 poster magazines and several special one-offs across nearly a decade of production. The comic was renowned for its well-pitched storylines that appealed to both the younger and older audiences, for expanding the Sonic universe beyond the canon of the game and introducing several original characters; some of whom suffered a grisly demise (poor old Johnny Lightfoot!). 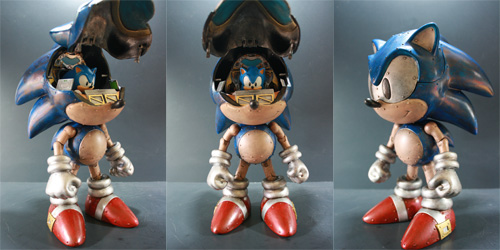 For the majority of issues, the comic was presented by Megadroid, a robot reminiscent of a SEGA Megadrive (and later a SEGA Saturn), who took to naming the readers “Boomers” (and the writers “Humes” – short for “Humans”). 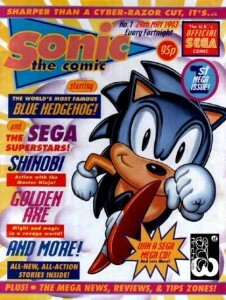 As well as the Sonic-themed strips, the comic included a whole host of stories from SEGA titles such as Golden Axe, Decap Attack and Streets of Rage, as well as features and reviews on games, as well as fan art and mail; many fan-works featured were created by many of those who have remained fans to this day! Indeed, the publication garnered many fans, and some of you reading this today will probably owe STC as your introduction to the world of Sonic the Hedgehog. SEGA today announced that due to expected heavy losses for the last financial year, the company would be undergoing a structural reform, and thus a number of staff redundancies have been announced across the board. According to IGN and TSSZ, the entire US QA testing department will be shut down amongst losses amongst other departments such as marketing. Consequently, SEGA will be trimming it’s roster of games, keeping it’s developing focus on titles such as Football Manager, the Aliens franchise and Sonic the Hedgehog among some of the names to be retained. SEGA did not say which games will be cut, but the company have stated that the reduction in size will benefit in sustained “profitability”. Although not strictly Sonic-themed news, this announcement will undoubtedly impact the franchise all the way down to the community teams who deal with TSS and other fan sites. We will keep you posted on any impacts in the Sonic Universe as they come. SEGASonic: Radio, TSS’ livestream of 24/7 Sonic the Hedgehog music, will unfortunately be closing it’s doors on Sunday for some much needed renovation. The station has been in a state of gradual deterioration for some time, with shows becoming increasingly intermittent and scarce, mostly due to other (mostly real-world) obligations of the DJs. Those of you who were at this year’s Sonic Boom event will definitely recognise this trio! RandomEncountersEnt have returned to thank everyone for 80,000 views of their Needlemouse: The musical video which won first place in the 19th birthday video contest last year. Their thank you comes in the form of the above video – enjoy! 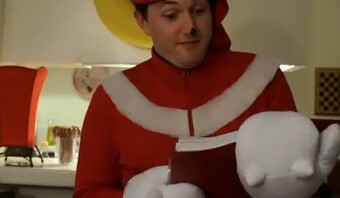 Check out the other videos of the RandomEncountersEnt youtube channel for other videogame parodies. There’s also a dancing Eggbot…Dreadknux and I apologise for talking over the top of it’s funky moves. Most of you will have enjoyed many years of entertainment from original videos to Summer of Sonic coverage through the Sonic Show‘s website and youtube channel. Unfortunately due to a malicious attack, the Sonic Show site and youtube channels both suffered an internet attack from a hacker earlier this week. While the Sonic Show site has survived, the youtube channel was deleted by the hacker, and unfortunately this has meant the loss of many years worth of hard work from the likes of hard working staffers such as Discoponies and Brad – including the Summer of Sonic 2008 retrospective. However it will take more than one moron with nothing better to do to bring the Sonic Show down! A new youtube channel has now taken its place, and slowly but surely materials are being re-added. I call upon all of you Sonic the Hedgehog fans out there who love the community to unite and support this rebuild by subscribing to the new Sonic Show youtube channel, so we can get this great show back on it’s feet. One of the most frequent questions we get asked every year is whether or not Summer of Sonic would ever be held in the United States, but due to many reasons “SoSUS” never come to fruition. Unsurprisingly though there has been a huge demand for a Sonic convention state-side, and it was really only a matter of time before one materialised. With the Sonic’s 20th anniversary around the corner, SEGA of America spearheaded plans to create their own official convention, the appropriately named Sonic Boom. 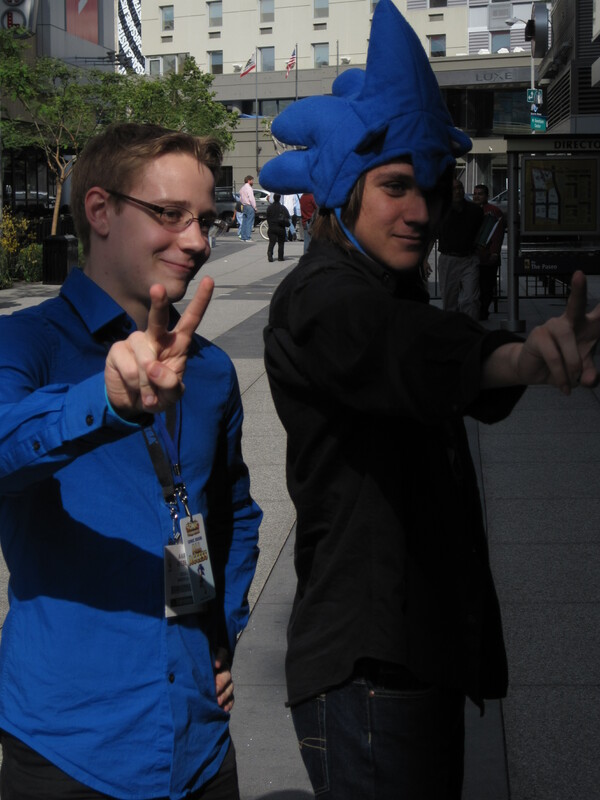 Aaron Webber, the newly appointed Sonic Brand Manager took on the role of chief coordinator for Sonic Boom and got in touch with Dreadknux and myself a few weeks back, and cordially invited us both to the event. We didn’t need to be asked twice! The convention had been carefully timed to coincide with the E3 Electronic Entertainment Expo in Los Angeles’ downtown convention centre venue. 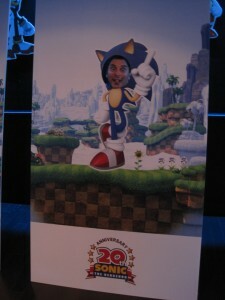 Sonic Boom was scheduled to take place in the moody and ambient environment of Club Nokia, a versatile bar come night club within walking distance of E3; a perfect site to celebrate twenty years of Sonic the Hedgehog. I arrived at the venue early in the afternoon with Aaron, and before we’d even made our way upstairs we were greeted by fans queuing outside Club Nokia; some of them had been camped out since 6am that morning in order to score a place inside the venue as they had not been able to acquire a ticket. If that’s not dedication, I really don’t know what is! Kellie and Julian from the American community team (who you will know from the Free Stuff Friday videos!) 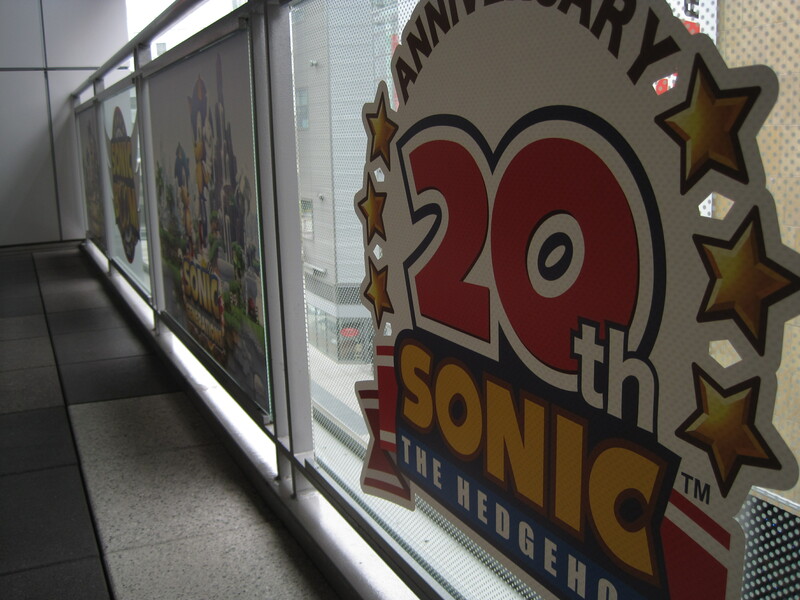 were running around upstairs in the venue coordinating the setup of stands, pods and making sure everything was in place – a familiar scene to anyone who has been involved in the organisation of Summer of Sonic! 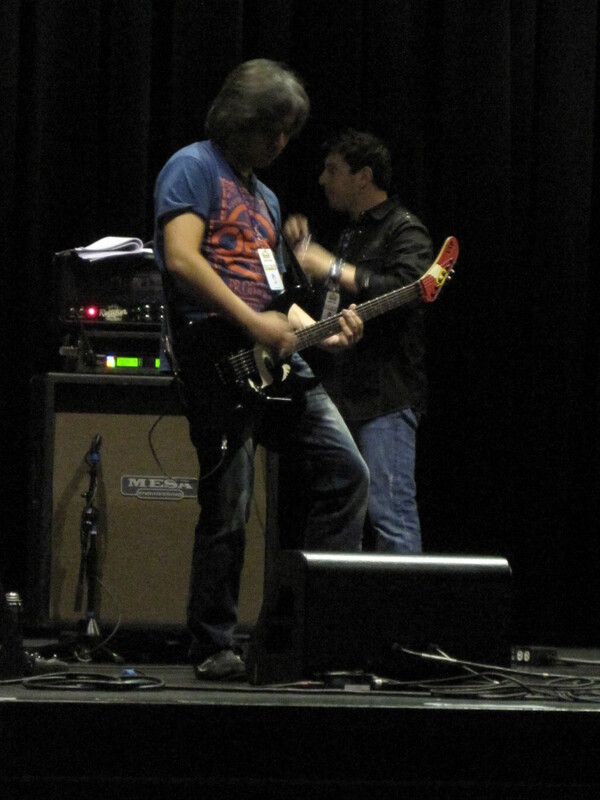 Even more familiar faces were up on stage as Jun Senoue, Johnny Gioeli and Alex Makhlouf (from Cash Cash, the band involved with the Sonic Colors soundtrack) were performing a dry run of the tracks they were going to be playing later on that evening. After a warm reunion with the guys I sat back to take some snaps and enjoy the privileged position of being an invited guest backstage at an event. I must have looked pretty dumb, but nevertheless I could not get rid of the huge grin on my face as the guys blistered through their fresh new set list, which included a brand new version of Sonic CD’s “Sonic Boom” and Sonic R’s “Super Sonic Racing”. What’s more, Alex’s accompaniment on synthesiser added another layer of ecstasy to the already monstrous set, and took the lead on the funky fresh new version of “Escape from the City” which will be gracing the in-game soundtrack for Sonic Generations! I got an opportunity to briefly catch up with Johnny after rehearsals, and as always was up for a bit of laugh, as you can see from the picture (although I don’t think SEGA will be taking him on as their new mascot – stick to your day job, Johnny!). Another act rehearsing on stage before the doors opened was the cast of Needlemouse the musical. 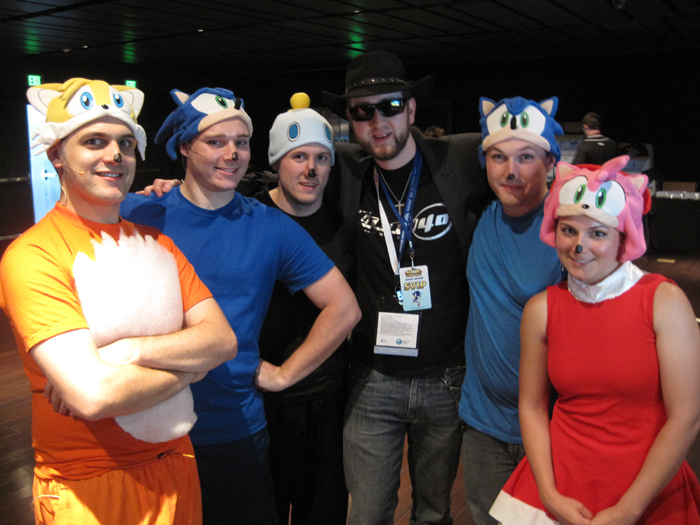 American fans will remember this bunch as the winners of the 19th anniversary competition last year, and were the lucky recipients of a trip to Japan to play Sonic the Hedgehog 4: Episode One. These guys were fantastic and incredibly animated on stage, so much so most of us assisting set up had to pause to watch and laugh at the jokes they were cracking. AJ and the bunch came to talk to me after their run-through, and were even kind enough to let me have my picture taken with them – an absolutely great bunch of guys and gals and well-deserving of the incredible ovation they received later in the evening (watch their performance here!). 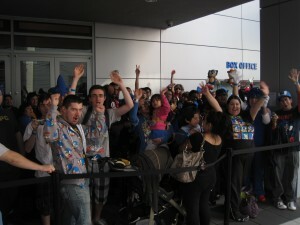 By 5 o’clock the venue was taking shape, with the merchandise stands set up (each entrant received a Sonic hat, a special edition Sonic Generations T-Shirt and badge set) and nearly twenty gaming stations were primed and ready to give the throng of rabid Sonic fans outside a chance to play the demo of Sonic Generations. 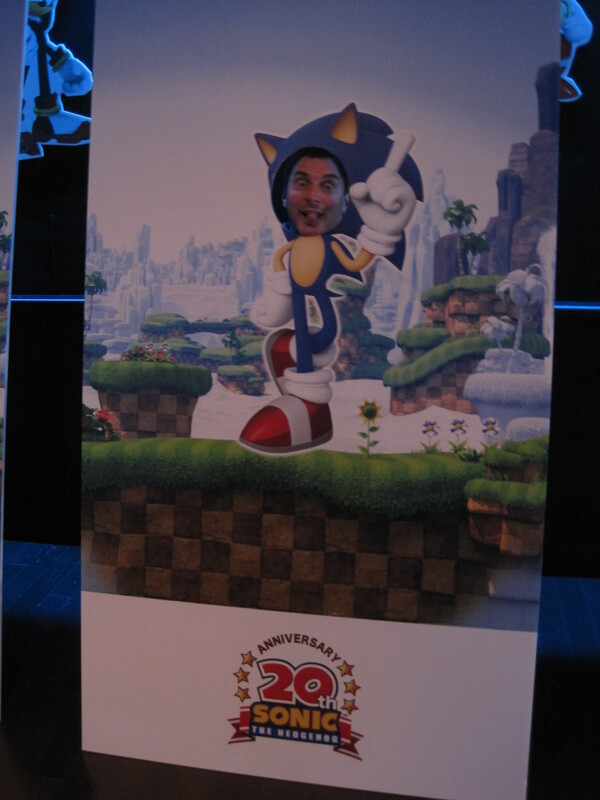 A number of photo booths had also been established to allow fans to record photographic postcards and video messages for Sonic’s birthday (you can check out Aaron and my postcard here, Dread’s postcard here and Yuji Naka’s here). Outside a huge queue of fans had formed, eagerly awaiting entry into the venue. Aaron and I went outside to rattle the crowd up a bit, and got to shake the hands of a few fans that had recognised Aaron and me. At 6 o’clock sharp the doors opened and the mass of fans piled in. I took a brief trip upstairs to the VIP lounge, where the likes of Iizuka-san, Oshima-san and Naka-san were meeting other industry members at an exclusive VIP event. Unfortunately I was not introduced to Naka-san, but I was reintroduced to Iizuka-san, who smiled courteously as we had already met that week! Dreadknux appeared at the venue after his busy day at E3 (and was fashionably late as always!) and we proceeded downstairs to the main event floor. A heap of guys came to greet Dread and I (there are far too many of you to mention!) and it really made our day – so if you came up and said hi, thanks loads; it really a pleasure to meet you all! TSS staffer, Sonic Retro writer and Sonic Show star Brad Flick was down on the time trial competition station hastily jotting down top scores on Green Hill Zone – you will have to keep an eye out for some hilarious pictures of Brad and Dreadknux in their bronik poses! Similarly to Summer of Sonic, there were a massive variety of cosplayers at the event too, including SSMB’s own mikeblastdude who came in an awesome Metal Sonic getup, and an excellent Charmy the Bee cosplayer. 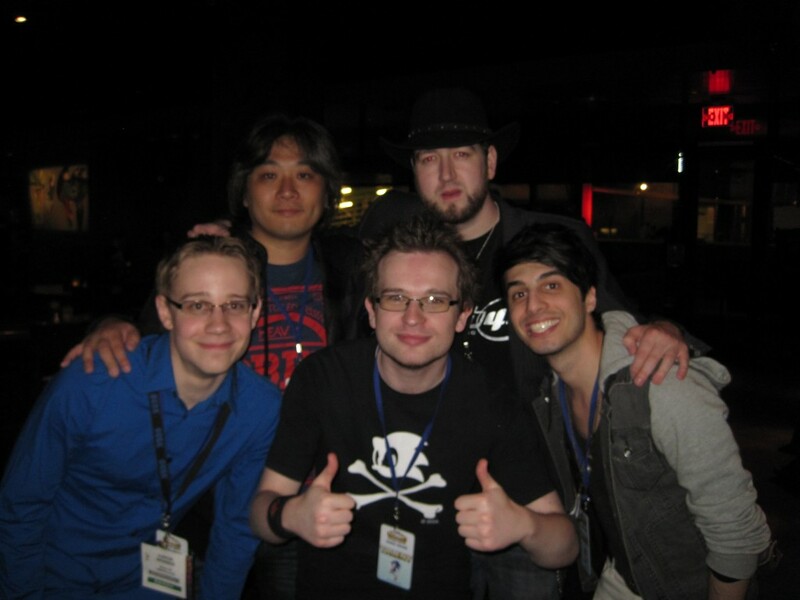 We also caught up with Scarred Sun from Retro and Shayne representing TSSZ news. I’ve never met either in reality before so we got to have a good chinwag and posed for a few photos for posterity – both are fantastic people and I certainly hope we get to all meet again in the near future. Aaron appeared on stage to welcome all of the guests to Sonic Boom, and it wasn’t long before Jun, Johnny and Alex were on stage blowing the socks off all those in attendance. A lucky few spotted Naka-san on the event floor and managed to grab his autograph and a photo before he disappeared backstage once more. Jun, not one for passing up the opportunity to meet fans, came down off stage with the legendary Sonic guitar to sign autos and pose for pictures with a handful of fortunate fans. 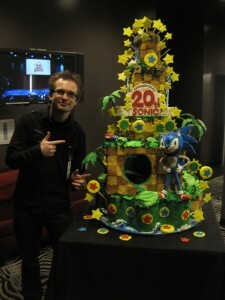 Following Needlemouse: the Musical, the best of the cosplayers were invited on stage to participate in the cosplay contest, and Iizuka-san, Miyamoto-san and Senoue-san were all invited up to wish Sonic a happy birthday and to sing him a happy birthday song…and of course, Sonic was present too, along with his birthday cake! 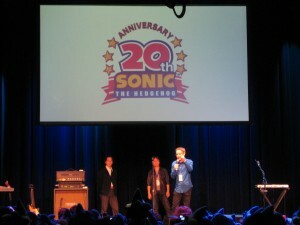 It wasn’t long before Dread and I found ourselves up on stage, telling the Los Angeles crowd all about Summer of Sonic. I had been really nervous beforehand about how the crowd would receive us on stage (especially considering the acts we were following!) but the audience were really receptive, and cheered us on – thank you all for letting us talk to you briefly, and hopefully we’ve enticed some of you to come to Summer of Sonic! Naka-san and Miyamoto-san, along with Oshima-san joined the cast on stage at the end of the show once again and were presented with the graffiti artist’s drawing of classic and modern Sonic which had been created over the course of the evening. I’m sure most will agree the evening past all too quickly, and before long it was time to close up the evenings proceedings. Dread and I pitched in to assist with the clean up, and ended up collapsing in the dressing room to have a chin-wag with Alex (who is also a massive Sonic nerd by the way!) After moving a precious cargo of guitars, we emerged on the street next to the Nokia theatre and ran into our good friend Richard Jacques, who was just as surprised to see us as we were to see him! Exhausted, we crashed for a few drinks at a local bar as well as a few last photographs of the day, and toasted the success of Sonic Boom. It’s 3am on Thursday, the 3rd of February, and fortunately for me Groundhog day won’t be repeating itself for me (although today seems to have gone on forever!) However for many of our American fans, their local groundhog will have predicted whether or not they will be having 6 more weeks of winter, of if early spring is on it’s way. However the tradition of calling the 2nd of February “Hedgehog Day” was a tradition continued by SEGA since the announcement of Sonic the Hedgehog 4: Episode 1 a year ago. 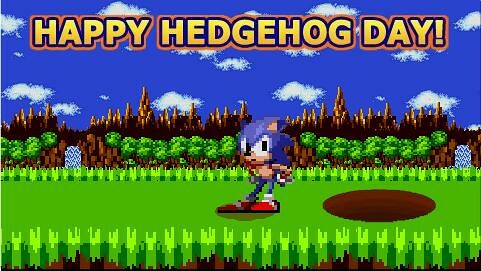 The SEGA America Blog is celebrating Hedgehog day in a very mysterious way…and no, I don’t mean the hedgehog weather-sensing facts either! Keen-eyed fans will notice that certain letters are highlighted throughout the blog, and in order, spell “Berlin”. Is SEGA giving us a hint as to a possible announcement that could take place soon in Berlin? Are the SoA employees enslaved to write the blog trying to tell us the city in which they have been locked in a dungeon and chained to a laptop? Is Sonic changing his name to Hans and moving to Germany? No doubt many fans will find this too much of a coincidence, and with two or three Sonic titles in the works this year, this is bound to get the fans talking. So what’s going on? Answers on a back of a postcard…or let’s hear your conspiracy theories or know-how in the comments! Well, here’s a story that will warm your heart up and maybe even bring a tear to your eye. ArchangelUK over at the Sonic City Blognik has posted up a touching story about a young boy with a life threatening illness who recently turned 4 called J-Jay. 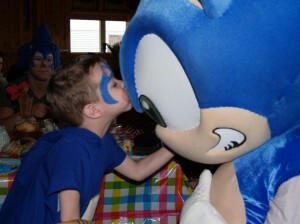 J-Jay is a huge Sonic fan and his biggest wish was to have his hero Sonic share his Birthday with him. Thanks to the combined efforts of the Make-A-Wish Foundation and SEGA Benelux the lad’s wish came true. A special Sonic themed Birthday party with Sonic himself in attendance was thrown to celebrate brave little J-Jay’s big day. Check out the full story with loads more photos over at the Sonic City Blognik. For more details about the Make-A-Wish Foundation, head over to their official website. 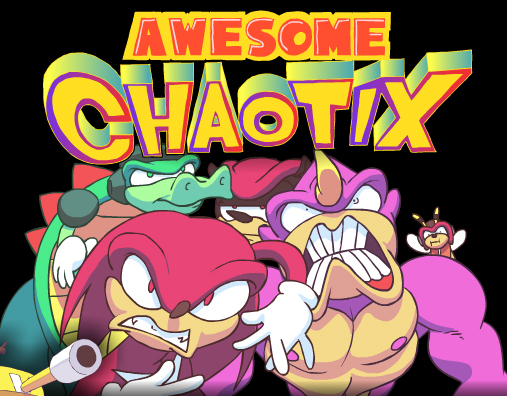 Newgrounds animator Egoraptor returns, this time with another Sonic-themed videogame parody, this time of the 32X title Knuckles Chaotix (if you haven’t seen the original Awesome the Hedgehog, check it out here). Expect lots of street talkin’ , a totally stacked Espio the chameleon, and an Oscar award-winning performance from Knuckles at the finale. Get your hankies ready. LOOK AT HOW SMALL YOU ARE! 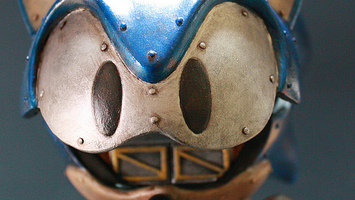 Fresh off the press, news has come about that Sonic CulT has won an auction for the script to the 32x predecessor to Sonic X-Treme, Sonic Mars! The script was being auctioned on eBay, and sold in the end for a total of $510, after many bid-sniping attempts from other bidders trying to obtain the item. The auction has only ended a few hours ago, so the script is not in the hands of Sonic CulT just yet. Various scans of the script on the auction page reveal that it is indeed legitimate, and that it contains a loads of information on Sonic Mars, including the plot, various concept sketches, level concepts, among other things. Continue reading Sonic Mars Script obtained! Some days ago TSS reported on a confirmed Sonic online project, although it was not to be revealed by SEGA or SONICTEAM, but rather a small starting company called Panovation Studios. Prower Power is planning a new summer event called ‘Chaos Con’, and it will be an exposition for all Sonic areas of fandom: Fanart, games, fiction and comics. Prizes are rumoured. The Sonic Stadium and Sonic News are set to cover the event when it begins in June. Information has been passed to The Sonic Stadium of an upcoming future Sonic animation appearing on your screens. Except, this animation will be showing on your PC Screens, not your Television. Enter the latest (if there was any previous) Sonic Fan Animation to hit the Internet, Fight 4 Freedom. There is information (on a link to the old website), and two available trailers of the cartoon series to have a peek at. It’s looking very tasty, so roll on August 2002!